James Grover Kennedy, 50 years old of Carmel, Maine, a dedicated husband, father, friend and mentor to many, died peacefully surrounded by family and friends on Saturday, January 12, 2019 at Waldo County General Hospital following a courageous battle with pancreatic cancer. James was born on April 10, 1968 in Lewiston, Maine. He grew up in Bucksport and graduated high school in 1986. As a child he battled leukemia and ultimately prevailed. James proudly served his country in the U.S. Air Force as a Munitions Specialist and was stationed in Germany where his first son, Michael was born. After his honorable discharge, he returned home and began his career in law enforcement with the Penobscot County Sheriff’s Department. 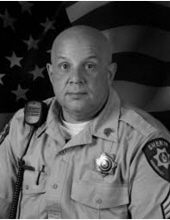 He started in the Corrections Division where he rose to the rank of Security Sergeant before transferring to the Law Enforcement Division where he worked as a rural patrol deputy before retiring at the rank of Sergeant in 2015. Upon retirement he went to work in the private sector, working for Schwan’s. Ultimately, James missed public service and returned to law enforcement, working part-time for the Searsport Police Department and fulltime for the Newport Police Department. James was twice recognized as the Deputy Sheriff of the year for Penobscot County. In 2004 he was presented a Citation for Meritorious Service from the Maine State Police, by Governor John Baldacci, for extraordinary lifesaving efforts in rescuing a motorist from a burning vehicle in Corinna, Maine. Additionally, in 2015 James received special recognition from the Penobscot County Sheriff’s Department for saving a child from a burning mobile home in Hermon. Throughout his law enforcement career he was thought of as a thorough investigator and the public greatly appreciated his community policing approach. James always had a unique ability at telling jokes and talking to complete strangers as if they were long lost friends. James enjoyed spending time with his family and friends, 4-wheeling, camping, woodworking, traveling and anything related to history. Christmas was James favorite time of the year and he particularly enjoyed this special holiday with his family. James was predeceased by his mother, Peggy Jean Dorr, his adopted father Chester Delworth Kennedy, and his daughter, Michelle Julia Kennedy. He is survived by his loving wife, Laurie Kennedy and sons, Michael, Dru, and Zachary of Carmel as well as several brothers, sisters, aunts, uncles, nieces and nephews. At James request, there will be no funeral services, but there will be a celebration of life in the spring for family and friends. In lieu of flowers, donations can be sent to Laurie Kennedy, 197 Damascus Rd. Carmel, ME 04419 to assist his family, whom he greatly cherished and worked tirelessly to support. To send flowers or a remembrance gift to the family of James Grover Kennedy, please visit our Tribute Store. "Email Address" would like to share the life celebration of James Grover Kennedy. Click on the "link" to go to share a favorite memory or leave a condolence message for the family.